These trousers, called a culotte de casimir in French, are made of casimire, a thin cotton or linen twill, and are absolutely typical of the outfits Napoleon wore at Longwood. 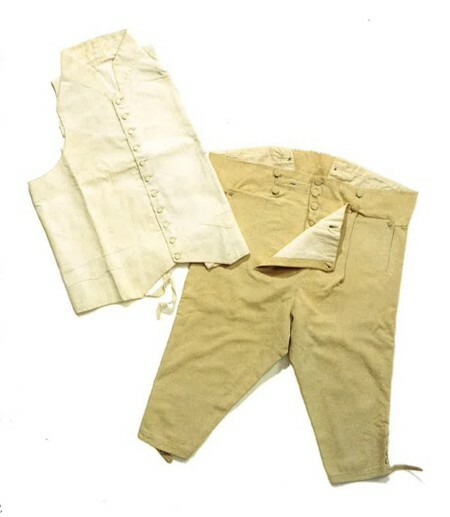 Likewise the cream waistcoat, which is very lightly embroidered, was a staple part of his day-to-day dress, along with a shirt, a smoking jacket, and red leather slippers. Although he would also don the chasseur colonel jacket with the red sash and plaque of the Legion d’Honneur if he went out, most of Napoleon’s time on St Helena was spent in this pale, rather conservative garb. Napoleon was, by all accounts, very particular about his wardrobe. He had stringent standards of personal hygiene, detested new clothes, prized comfort above sartorial showiness, and was consistently the most simply and modestly dressed of all his St Helena entourage. Marchand, his valet, had taken care to stock up on basic items before leaving France, ordering some four dozen shirts, thirty-seven pairs of underwear, and nineteen pairs of casimire trousers, as well as a sizeable supply of smoking jackets, waistcoats, handkerchiefs, and stockings. Yet in spite of this preparedness, five and a half years of exile took their toll on the Emperor’s wardrobe, with only a tiny proportion of this vast quantity of clothing remaining on his death. Acquired by the Fondation Napoléon in 1992, these items were formerly in the collection of the Abbé Vignali, who arrived on St Helena in September 1819 and who officiated at the funeral of the fallen emperor in May 1821. In his will, Napoleon had wished for the majority of his clothing to be bequeathed to his son, the Roi de Rome, but since this was not possible, Madame Mère distributed the clothing between six members of the Imperial family: Élisa, Caroline, Jerome, Lucien, Joseph and Louis. This waistcoat and trousers were given as a gift to the Abbé Vignali by Napoleon’s executors in thanks for his dedicated service, and remained in the Vignali family until the late 1970s.